One of the quietest players in the NFL, and at the same time, one of the most productive. The St. Louis Rams’ sure-handed speedster Torry Holt wore this white mesh jersey during the 2000 season. Holt secured his spot as one of the NFL’s top wide receivers in his era. Holt’s career also includes 7 Pro Bowls (2000, 2001, 2003–2007) including five straight, 74 career touchdowns for 448 points (including 2 two-point conversions) and 920 career receptions. He ranks among the top 10 active leaders in receiving yards, receiving touchdowns, and receptions, and has finished in the top ten of those three categories in five straight seasons(2003–2007). Holt has also led the league in receiving yardage on two separate occasions (2000, 2003), and receptions once (2003). Holt is tenth all time in receiving yards, and eleventh all time in pass receptions. 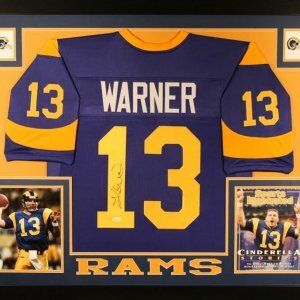 This is a fine representation of a Holt Rams game-worn jersey. The jersey is made by Puma and is size “46”. NOB “HOLT” is sewn on in single color blue tackle twill on a nameplate. His jersey number “88” sewn on front and back in shadowed blue/gold tackle twill. The sleeves and torso sides are elasticized for easy fitting. 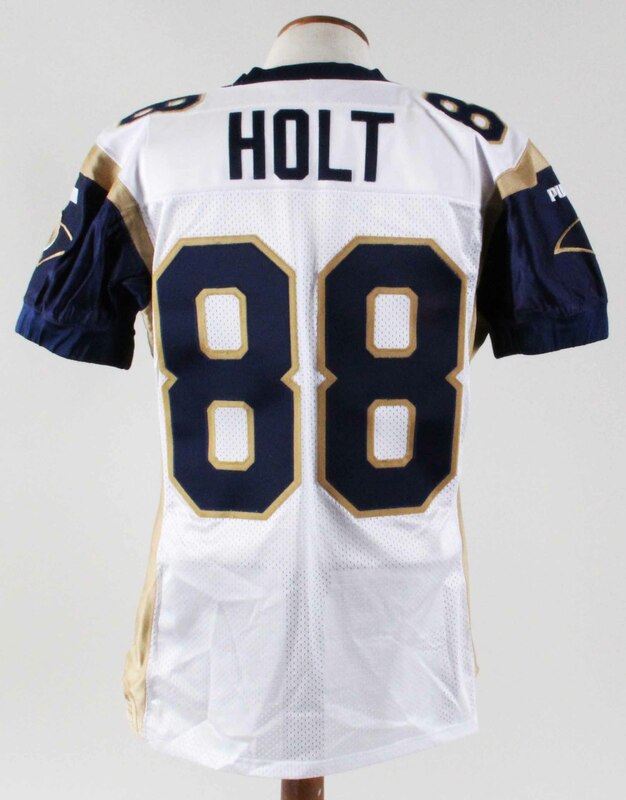 Both sleeves feature the prominent Rams patch / Puma logo along with his number “88” on the upper shoulder portion. The strip tag in the collar reads “00-46” denoting year worn and size. Overall, the jersey exhibits nice wear with loose threading and minor pilling.